Drifting out from Vietnam’s north coast in a wooden junk, your eyes will be riveted upon a jagged wall of emerald green. Only when the wall swallows you up, and you find yourself in a fairyland of other-worldly limestone peaks jutting from the water, this is Halong Bay, one of Seven Wonders of the World and Vietnam’s number-one tourist attraction. 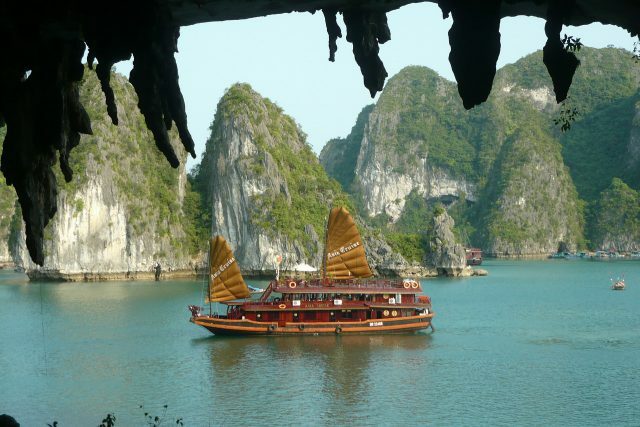 There are a wide variety of Halong Bay tours available. Most opt for a two-day, one-night tour and three-day, two-night trip. Competition between tour operators is incredibly fierce and a common question of any traveler is: How to find the great Halong Bay Cruise tour for their trip? Here are some tips for you, just follow these criteria then you’ll find your perfect Halong Bay cruise tour trip. Most foreigners visit the bay on tours from Hanoi. 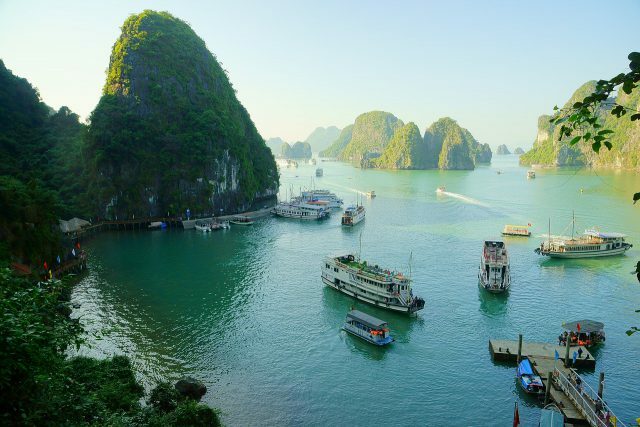 It’s possible to do the same thing independently, though you won’t save much money as the way transferring from Hanoi to Halong Bay is quite complicated. First of all, you have to catch bus to get to Ha Long city, then head to Tuan Chau tourist wharf, buy tickets from the booking desk and wait to get on the cruise. The main purpose of a Halong Bay cruise tour is to provide with the tourists the convenient itinerary to capture the quintessence of the bay along with combining various interesting adventure activities. As of that, I highly recommend you should book a Halong Bay cruise tour instead of planning a trip on your own. From October – March: Best time to visit Halong bay. With the cool and dry weather, you can take a lot of harmonic-color Halong Bay photographs as well as join outdoor activities such as kayaking, visiting villages, exploring caves, etc. From April – September: The sudden rains along with thick mist may decrease your mood during a cruise trip. From July and August: The most erratic weather of the year. Sometimes, the administration of the bay will not allow Halong Bay cruises to depart as of the unpredictable storms. This doesn’t happen too often but will be a pity if your trip would be canceled. Your budget: It is considered as the main factor to book any service. At first, you need to refer to the cruise categories, including Luxury cruises, Mid-range cruises, Budget Cruises, Private Cruises, Day Cruises, Family Cruises and Honeymoon Cruises. Which one of these kinds of cruise you prefer most? The length of the cruise tour: A day cruise or an overnight cruise? A day trip – it can be very rushed to discover the ethereal beauty of Halong bay in just 8hr round trip. An overnight cruise trip – with the night spent at sea, plus a day on the bay for various outdoor activities, this would be a delightful experience. 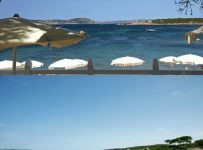 The tourist attractions: Mainly divided into 3 main attractions: caves, villages and beaches (or island). There will be a lot of things to uncover such as Bai Tu Long Bay, Cat Ba Island, Vung Vieng Floating Village, Trong Cave, Lan Ha Bay, Sung Sot Cave, Cong Do or Cong Dam, etc. 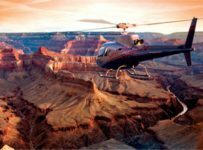 Find out which attractions are the most interesting to you then find a cruise tour offering an itinerary includes those. Check the reviews of previous travelers on its website or TripAdvisor. Check the itinerary and operating schedules, the more detailed they are the more professional tour you get. Check the contact information along with the headquarter address. Join a cooking class on cruise. You’d better book a cruise tour online through a travel agency instead of booking directly on arrival in Halong Bay. This helps you to avoid the situation of fully booked. Hope that these tips are useful for you to start planning a trip to Halong Bay, one of Vietnam’s most intriguing destinations.